Greenwich businesswoman Dita Bhargava, who is testing the waters for governor, speaks during a Norwalk Democratic Town Committee forum at Norwalk City Hall on Monday January 29, 2018 in Norwalk, Conn.
Dita Bhargava bristles at talk that she could run for a different office instead of governor. State treasurer is one that the former hedge fund portfolio manager’s name has been linked to by some rival Democrats. 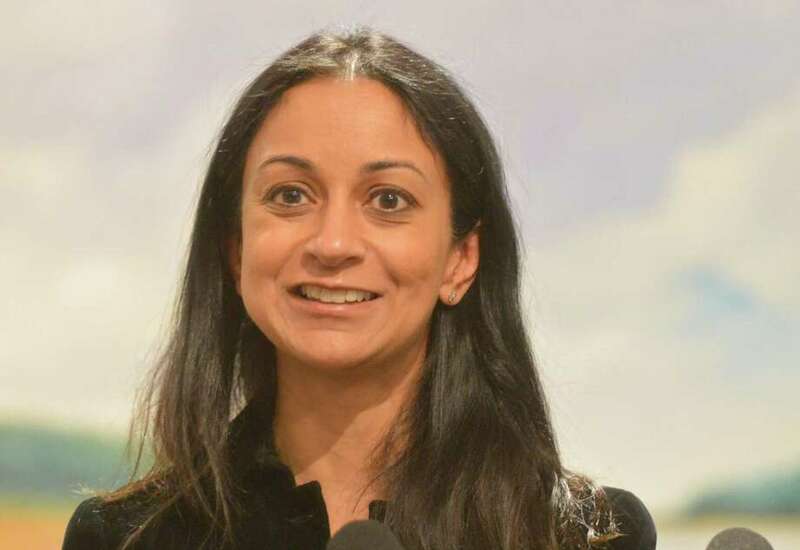 Whether it was on Wall Street or running for the Legislature two years ago, the Indian-American businesswoman from Greenwich said she’s grown accustomed to others trying to pigeon-hole her. “I’m used to people telling me I don’t belong somewhere,” said Bhargava, who previously worked for Citigroup, Credit Suisse and Citadel, a major hedge fund. During her finance career, Bhargava said she endured sexual harassment in the workplace. Bhargava said she hasn’t ruled out anything, including switching her exploratory committee to a candidate committee for governor. She contends that her pro-business platform makes her more electable than other Democrats, many of whom she said bring baggage to the race. “I think I have the best chance to keep our state blue by winning in a general election,” said Bhargava, the party’s former vice chairwoman.